Ask most marketers where Facebook, and social media in general, has its greatest impact and the answer you’ll most likely get is pre-purchase brand awareness. This makes sense since most businesses track easy-to-find metrics such as “likes” and mentions that build brand but have difficulty attributing social media’s true contribution towards sales. Less expensive to retain and market existing customers. Since you’ve got your customers’ contact information, you don’t need to spend money on third party media to advertise to these people. Direct marketers have used this principle for years. Spread the word about your firm. This isn’t limited to social media. According to research by Ed Keller of Keller Fay, people engage in more face-to-face endorsements that result in customer actions. Help brand your organization. By using your products and spotlighting them in their photographs on Facebook and in real life, your customers help build your brand. Again companies have been doing this for years by giving stars their product to wear and use. The value of someone who has “liked” your brand on Facebook in key consumer categories was $174.17, up 28% from $136.38 in 2010 based on Syncapse research’s The Value of a Facebook Fan. By contrast, the average Facebook user generated about $5.32 in revenues for the platform itself in 2012. As a marketer, understand your specific results may vary. Here are three ways to take advantage of Facebook’s post-purchase impact. Incorporate a message on your receipts encouraging customers to like your firm. This can be done on both online and offline receipts. It’s easier to include a link in an online correspondence. Spotlight your customers. Send customers a post-purchase communication asking them to submit their photographs on your Facebook page. This helps make your buyers feel good and shows your product in action. Offer your existing Facebook “fans” the velvet rope treatment. Give them a sneak peak at your product and the ability to purchase it before the general public. This is one way to get them talking about your product early. The bottom line is that you must give your raving fans the support they need to help sell your products. This doesn’t mean make them into product hawkers but rather make them feel special and provide them with the means to show their love for your brand. 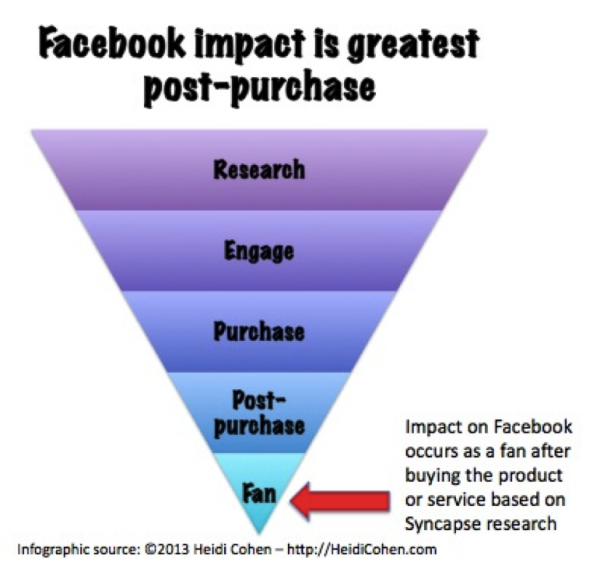 Have you found evidence that your Facebook “fans” (aka likes) yield measurable results post-purchase?